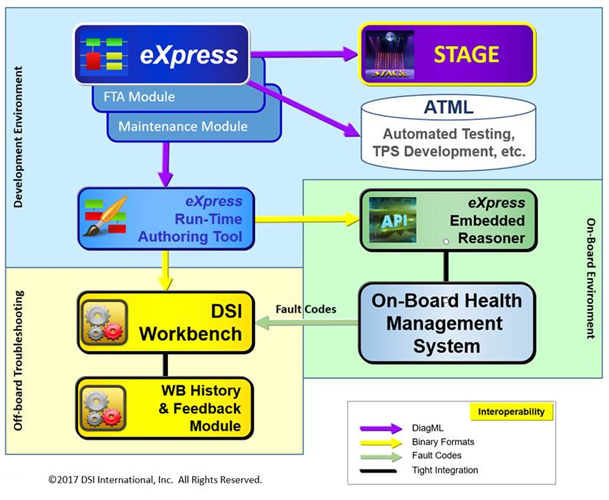 DSI Workbench allows for deployment of eXpress or user supplied diagnostics within production and maintenance troubleshooting environments. 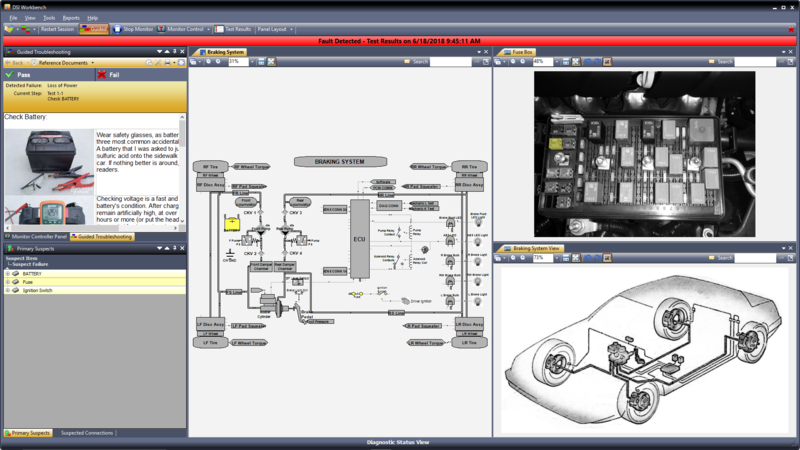 DSI Workbench facilitates the integration of diagnostic design views, engineering views, photos and videos within an integrated environment. 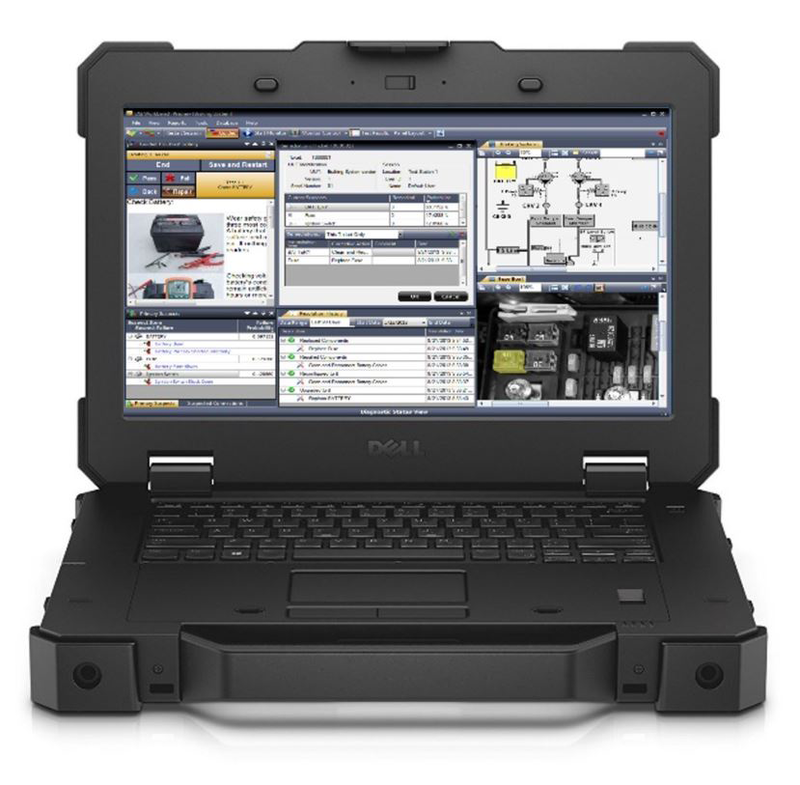 DSI Workbench can bring the designer’s and maintainer’s captured knowledge into the hands of technicians and maintainers regardless if they’re servicing more commonplace commercial systems or very large and complex defense and space systems. • Embedded with the on-board test executive to perform as the “Diagnostic Executive” and “Diagnostic Reasoner”. DSI Workbench can be set to “Monitor Mode” to function with the “pass/fail” Test Results from a Automatic Test Equipment (ATE). When any test fails, it is immediately signified by the red horizontal bar extending across the top of the display. From this point, the technician can continue with any additional testing as needed to isolate to smaller fault groups or to a single component. DSI Workbench can be set to “Guided Mode” to function as Portable Electronic Maintenance Aide (PEMA) or Interactive Electronic Technical Manual (IETM) to bring the knowledge of the design to the Technician in a “Guided Troubleshooting” application. DSI Workbench comes standard with a “static” (predetermined test sequencing) diagnostic reasoning capability. During the Development Lifecycle, engineering analyses and Test development is initially calculated from the perspective of the performing of static testing capabilities. This is required by most military applications as static reasoning offers a mechanism to fully expose and document the test sequencing of predetermined test and maintenance procedures for fault isolation or troubleshooting activities. A “Dynamic Reasoning” option is available for DSI Workbench that enables more alternative testing and diagnoses to be based on more dynamic constraints. The sequencing of the testing will depend upon an infinite number of factors or criterion during that particular “Diagnostic Session”. The two most fundamental requirements of a Dynamic Reasoning application would be to fully accommodate the free-form ability to “Skip”, or “Back-up” Test Scenarios. Examples of such scenarios where the technician is “Unable to Perform the Test” may be due to any reason, including the unavailability of on-demand Resources (i.e. Safety, Time, Labor, Test Equipment, Skill Level or Security Access Rights). DSI’s Dynamic Reasoning is able to be verified during the Development Lifecycle by using the “Desktop Fault Isolation” feature in eXpress, and/or the advanced “TestDRIVE” utility supplied with the standalone DSI Dynamic Reasoner or the DSI Embedded Reasoner. 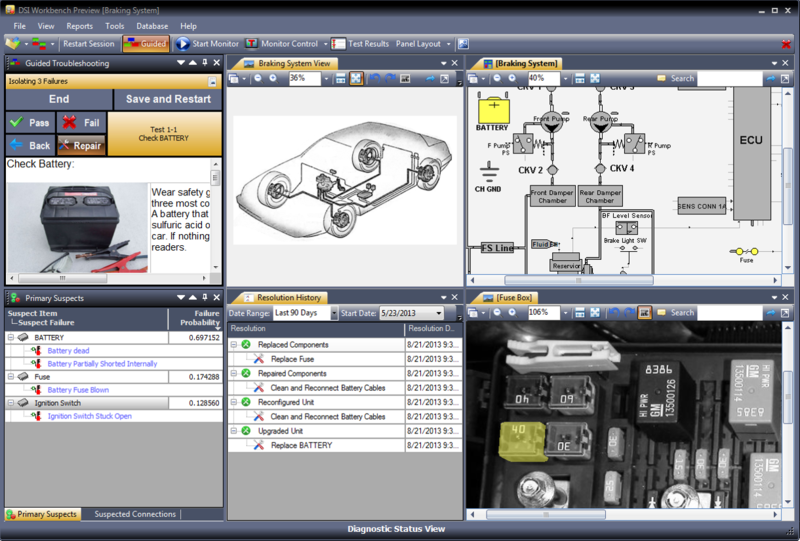 During Session – By following each “test” in top left window, your “Primary Suspects” list appears in the bottom left window (ranked by failure probability) and in “yellow” in the display windows. The items that become exonerated, or proven to be “good”, are colored in green as you step through the Guided Troubleshooting session. End of Session – When there are no further “tests” suggested to be performed in the top left window, you will have isolated your failure to the fault group(s). The “Primary Suspects” list that appears in the bottom left window will then list the fault group(s) that contain the failure(s) by replaceable item(s). The item(s) can be expanded to list the root failure(s). These same failure(s) are represented in “red” in the display windows. All items that become exonerated, or proven to be “good”, are colored in green and any “secondary” failures that are represented in “blue” to indicate that you still have not confirmed the diagnostic status of those remaining items, if any. End of Session – Again, this is a closer look at the “Primary Suspects” list that appears in the bottom left window. As the listing is expanded and the root failures are identified, the you can “right click” on any of these failures and immediately gain access to the precise location in any document, or video, to view the specific test or repair procedures for that fault group, as well as any component properties (i.e. part, serial or LCN number, Manufacturer, cost, etc.). Access rights to any specific detailed information is fully controlled and authored via the use of RTAT. DSI Workbench can also be used in advanced Health Management applications where the hosting system has computing resources available. In this role, considerably more effective health assessment interactivity is gained from the use of the Diagnostic Reasoner and the Diagnostic Executive “packaged” within DSI Workbench, along with the host’s on-board Health Monitoring (or embedded BIT) and Test Executive capabilities. 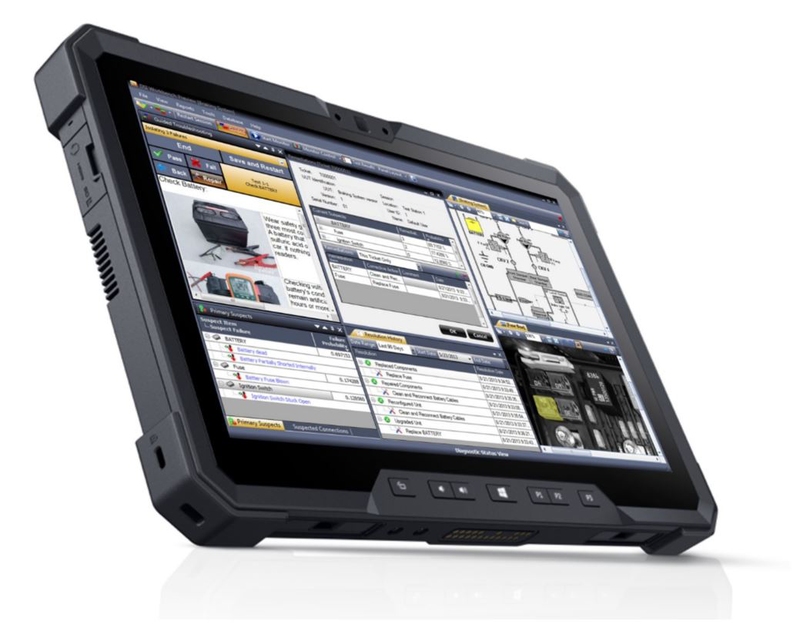 When used in this high-end capability, DSI Workbench is able to offer a wide array of advanced and customizable options to any on-board Health Management system. Since this approach ensures direct traceability back to the digital design, it offers a holistic method that is able to be easily and immediately updated throughout the full Product Lifecycle. 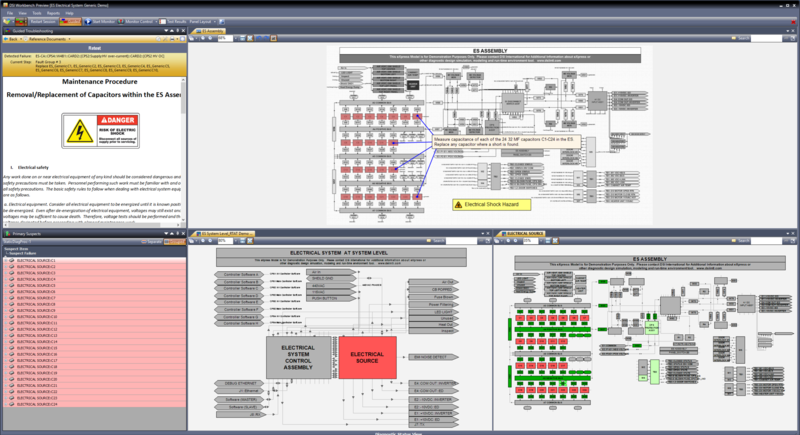 The DSI Workbench History & Feedback module tracks and records maintenance actions and fault resolutions in DSI Workbench. 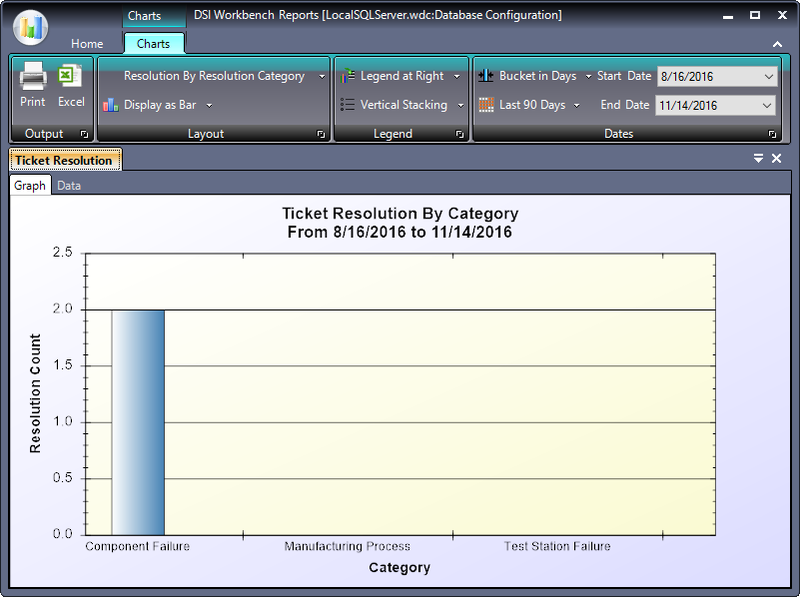 The Workbench Reports application provides reports on resolution history and maintenance performance. Setup and maintain troubleshooting tickets. Tracks and reports upon fault resolutions. Provides reporting for administrators to gage the performance of diagnostic and maintenance actions. 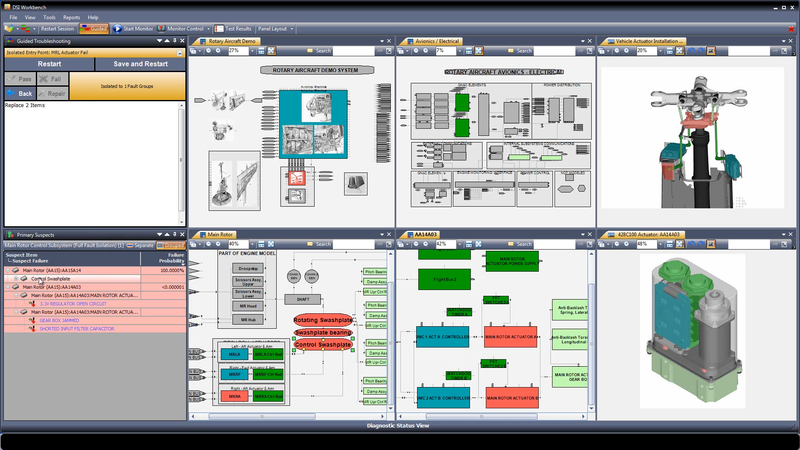 DSI Workbench can bring the designer’s and maintainer’s captured knowledge into the hands of technicians and maintainers regardless if they’re servicing more commonplace commercial systems or in larger or more complex systems. Notice the lower-middle window in the image below. This is an example of the historical data that can be used to inform the maintainer of the resolutions to similar failures that were most recently logged into the local or remotely accessed database. 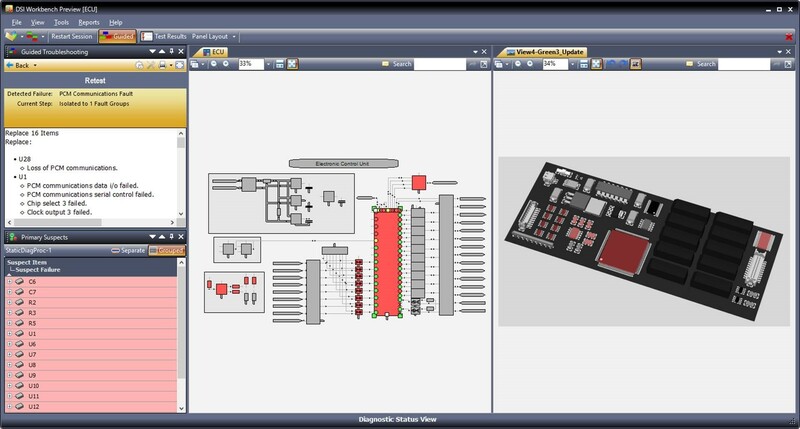 The DSI Workbench Application Programmable Interface is an optional module for DSI Workbench. It allows for embedding the DSI Workbench diagnostic reasoning, controls, reporting and data tracking capabilities into a custom user developed application. The API provides feedback from databases and user prompts into reporting of diagnostic actions taken. Allows for deployment of eXpress generated static diagnostics to work with user supplied tests executives and maintenance software. Automated reporting of diagnostic results based upon supplied test conditions. Allows customization and configuration of diagnostic reporting methods. Supports tree-based diagnostic, dynamic diagnostic sessions and fast fault signature lookup. ** For more information regarding DSI Workbench API, click here. 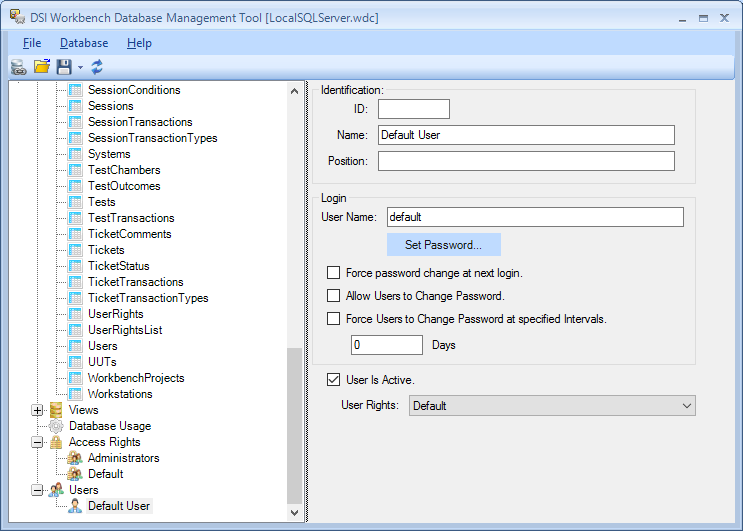 The DSI Workbench Database Management Tool allows database administrators to create, setup and manage databases used for storing repair and fault resolution records from the DSI Workbench Database. Using this tool, the administrator can create and setup a new database to a predefined database template. 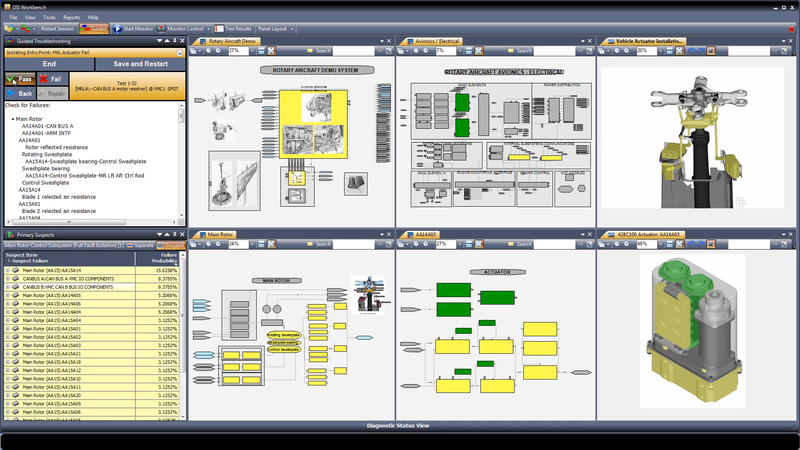 This includes setting test locations, operating conditions, resolution categories, resolution types, user rights and users (note: administrators may also directly add and administer users directly within DSI Workbench) all of which can be directly stored in the template and applied during the initial creation of the database. 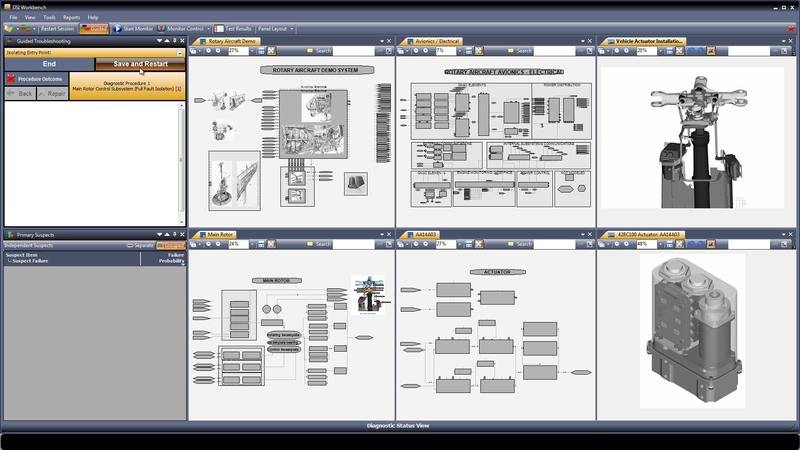 The DSI Workbench Report Viewer automatically generates reports using the data stored in the DSI Workbench database. The tool allows project planners and administrators to run queries and checks to determine the effectiveness of currently deployed diagnostics and identify areas needing improvement or redesign. In addition, more specific inquires can be performed to examine the state or status of specific units under test and repair.